NEW YORK, September 24, 2018 – Poet George Held and illustrator Bryan Canniff have moved into a world of dark fantasy in their new collaboration, “Under the Escalator” (UTE). It’s the tale of a boy, an escalator, and some trolls. What would happen if the boy went all the way around on the conveyance? What or who would he find? Would he survive the trip? In 1898, an early escalator was installed at Harrods department store in London, where unnerved customers were revived by smelling salts. Modern riders have become more accustomed, but most have experienced the hesitation at the first step. Who knows what the children are thinking! Maybe they are in the same fantasy world as the little boy in UTE. Does he come out alive? Are the trolls all-powerful and intelligent — or the opposite? Written in blank verse, the UTE poem contains a thread of internal rhymes. Mr. Canniff’s illustrations, though still, suggest constant mechanical movement. This prompted the publisher to plan an animated short of the book, to be released in 2019. An original score for the work is being created by Kenji Haba. GEORGE HELD, author, has written 20 volumes of poetry, including three books for children about nature: the Neighbors series. His work has been read on NPR, and he has received 10 Pushcart Prize nominations. A former professor of English at Queens College, City University of New York, Held also taught for three years on a Fulbright in Czechoslovakia. He holds degrees from Brown, the University of Hawaii, and Rutgers. BRYAN CANNIFF, illustrator and designer, has consulted on or designed five children’s books. He has also served as an art director for the former Saturday Review magazine, and for publishers such as Hearst, on Popular Mechanics, winning numerous design awards. His early work includes the design department of The Museum of Modern Art, after graduating from the Minneapolis College of Art and Design. 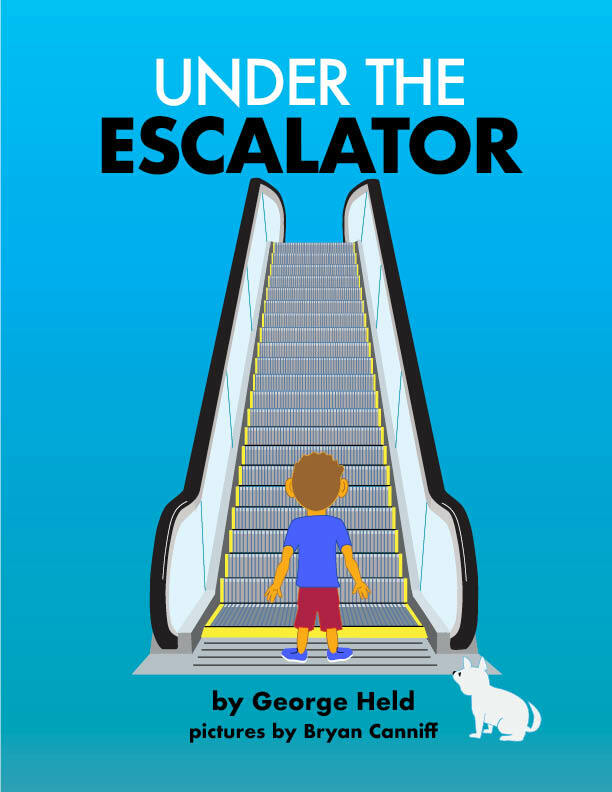 UNDER THE ESCALATOR / by George Held / illustrations by Bryan Canniff / publisher: Filsinger & Company, Ltd. / price: $12.00 softcover / ISBN: 978-0-916754-23-5 / ages: 5-9 / pages: 16 / publication: September 2018 / available: http://www.amazon.com, Baker & Taylor, Follett School Solutions, www.filsingerbooks.com — and through your local bookstore. Source: Filsinger & Company, Ltd.